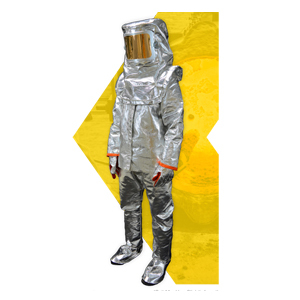 The X20 Lightweight Industrial Proximity Suit is designed to protect from radiant, convective, and conductive heat. The X20 is fabricated with a Z-Flex® outer shell and is available with your choice of a standard flame retardant cotton liner for lightweight breath-ability or an upgraded neoprene liner for added protection from hot steam, gas, and vapor. The Z-Flex radiant shell reflects 95% of radiant heat and tolerates and radiant temperatures up to 3000°F (1650°C). In addition to providing outstanding protection, Z-Flex is also the most durable aluminized material available and will not de-laminate under even the most demanding conditions. This suit can be used in a wide range of industries including foundries, petrochemical plants, processing facilities, and other environments where workers are exposed to extreme temperatures.